Pope Paul VI instructed the Sacred Congregation for Divine Worship to assemble a Mass setting of Gregorian chant that would be easy and accessible to church congregations. They did so, and in 1974 the Jubilate Deo Mass was released, and issued by the Pope "as his personal gift to the Catholic Bishops of the world and the heads of religious orders." The individual pieces are relatively simple chants, and come from a variety of different Mass settings in the Editio Vaticana. Unfortunately, a lot of hymnals in current use in the US do not include this setting (or any Latin setting at all), so when we tried to introduce various Latin settings at St. Patrick's (of Galesburg, Ill.), many in the congregation complained---understandably!---that they did not know the words and couldn't sing along. I looked around and found some versions online (e.g. from the St. Cecilia Schola), but they were often bitmapped scans of older printed booklets, usually had no English translations, and either used square notation (which is beautiful and traditional but very unfamiliar to modern eyes) or a very busy notation involving eigth-notes and quarter-notes that are hard to read. So I re-engraved it myself. "Pseudo-chant" notation: filled and open note heads with no stems; this is much easier to read for people who don't read music. Natively PDF: because this was engraved directly to PDF, it can be printed on a good laser printer and be indistinguishable from professionally-printed booklets. Translations: Although the phrase-by-phrase English translations are not valid for liturgical use on their own, they give congregations who are unfamiliar with Latin some idea of what they are singing in each phrase. Antiphonal Gloria: The Gloria is meant to be sung from start to finish. However, while a congregation is still learning it, you may find it useful to follow the pattern frequently used in English-language settings, with the first line ("Gloria ... bonæ voluntatis") as a "refrain", and the remainder broken into three "verses" that might be sung by a cantor or choir at first. 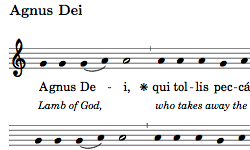 Once the congregation is familiar with the the whole piece, you can switch to singing it straight through as intended. In late November 2007 I updated the booklet with a few layout changes to make it look better. (Most noticeably, every line has a treble clef symbol on it now.) In a couple of cases, the line breaks changed slightly, but the pagination remains the same. I also made a few small changes to improve the translations. 2-up binder layout: Like the booklet layout, prints two pages side by side, but pages are in order. Suitable for single- or double-sided printing. If you are interested in using this but need it in a different format, don't hesitate to ask---it's possible I'll say no, but I still have the source files and it is very, very easy to generate tweaked versions.